Disasters triggered by natural hazards are an unparalleled threat to sustainable development. 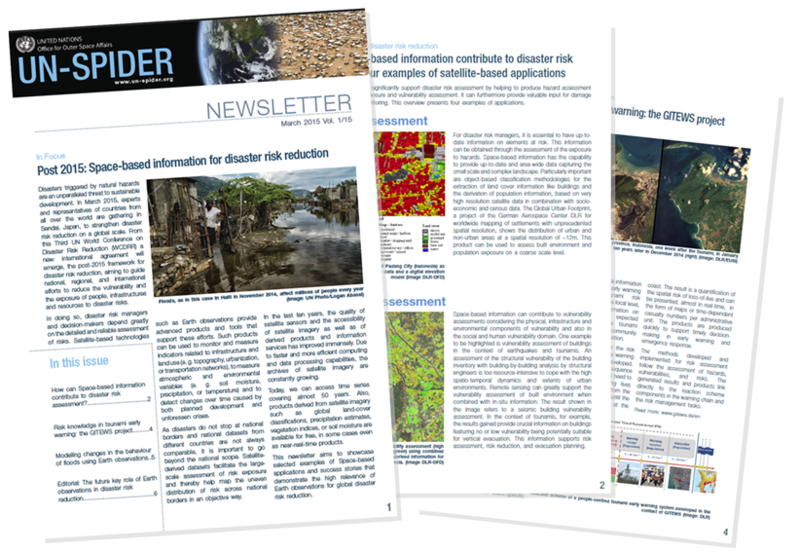 In March 2015, experts and representatives of countries from all over the world are gathering in Sendai, Japan, to strengthen disaster risk reduction on a global scale. From this Third UN World Conference on Disaster Risk Reduction (WCDRR) a new international agreement will emerge, the post-2015 framework for disaster risk reduction, aiming to guide national, regional, and international efforts to reduce the and the exposure of people, infrastructures and resources to disaster risks. In doing so, disaster risk managers and decision-makers depend greatly on the detailed and reliable assessment of risks. Satellite-based technologies such as Earth observations provide advanced products and tools that support these efforts. Such products can be used to monitor and measure indicators related to infrastructure and land use (e. g. topography, urbanization, or transportation networks), to measure atmospheric and environmental variables (e. g. soil moisture, precipitation, or temperature) and to detect changes over time caused by both planned development and unforeseen crises.